If you have any questions or want to enquire about dates, use our form to contact Hugo Campbell. 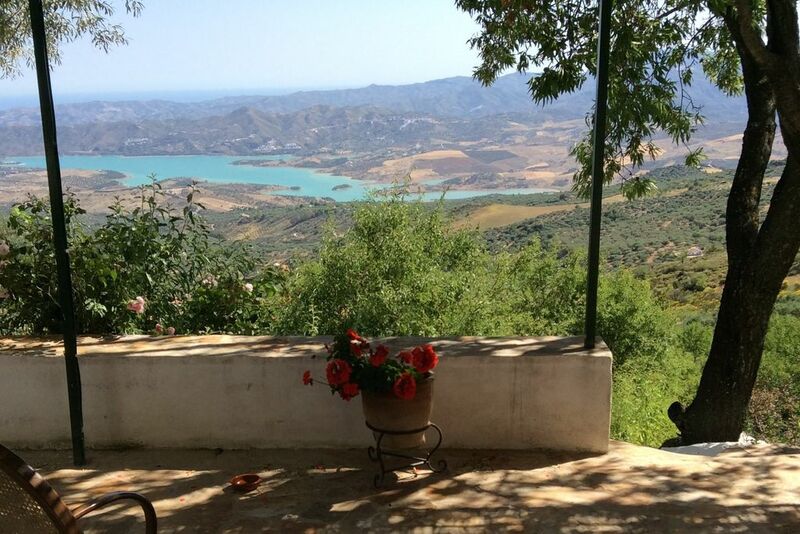 Leaving behind pretty Periana you climb through olive groves, then ascend a steep track to the sleepy old hamlet of El Canuelo – with glorious views of Lake Vinuela. The highest of several holiday homes, 300m above the restaurant/bar and pool (focal point of the village) is your house, 40 years old, with dreamy terraces to the front and side. 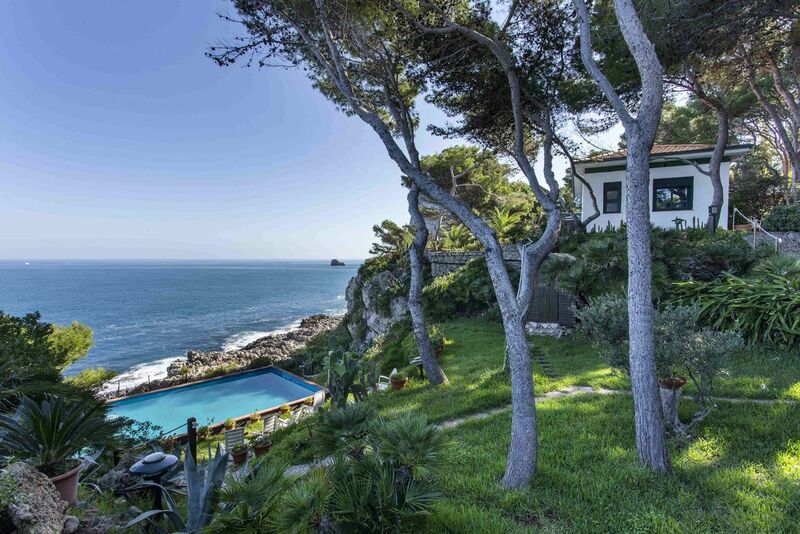 At the back all is steep, rocky and scrubby; below, steps wind down to the pool and the terraces, bougainvillea, lavender, jasmine and sea views. The lovely Manolo and Anna who run the bar welcome you, and are happy to prepare you a paella if you ask in advance. Step in to a charming sitting room opening to a side terrace, with Guatamalan tapestries, comfy sofas and old feeding troughs on show (spotless and painted!). Then the dining room and the kitchen, rustic and rural, a practical space in which to cook. Bedrooms are sweet and cottagey, one is on the ground floor, some are beamed, and all have simple furniture and splashes of colour. A laundry room adjoins the house. The wonderful hot springs of Alhama de Granada are an easy drive, as is the Water Park in Torre del Mar. Minimum stay: 3 nights; 7 nights in high season. Short breaks available. Pets by arrangement. Parking available directly below the house. Extra house available to rent for 6 people. Los alamos is a place to leave the hustle and bustle behind and really enjoy the simpler things of life....cooking...reading...sunsets...sleeping...swimming and catching up with friends and family over a bottle of wine. Warm days and cool nights makes it fantastic holiday conditions especially for children. The house is big enough to allow everybody the opportunity to chill out both inside and out without getting in each other's way. The top lounge area outside is a great place for a nap I found....the pool and restaurant are a great hub, very sociable but low key. A great place for all ages. For larger groups, there's another Sawday's house next door, Casa Santo, which sleeps another 6 people. Please enquire for more information. Historic town of Alhama de Granada with its dramatic gorge and nearby hot springs, only 40mins away. Seaside town of Torre del Mar with beach, promenade, waterpark, shops, restaurants, cinema, go-karting, bowling and ice cream parlours galore only 30mins away. Horse riding and quad biking available nearby. El Canuelo restaurant often used as a stop off point en route. Visit the Alhambra Palace in Granada, only 1hr 30mins away and the famous caves of Nerja and its pretty streets which is only 1hr away. Visit the bustling city of Malaga, shop in the market and stroll along the coast by day and watch Flamenco dancing or a bullfight by night.